Just down the hill from the border, at the bottom of the valley we found an abandoned hydro-electric station. After a thorough inspection of the all the old machinery, electrical switch boards and water channels by Tim, Rebecca swept the glass off the floor with a leafy branch and we made camp in the main turbine hall. With a roof over our head, the tent wasn’t needed so the groundsheet was laid on the concrete floor followed by the roll mats and sleeping bags. After a quick meal of rice and chopped up salami, we were savouring our first beer in quite a few weeks whilst reflecting on Turkey and celebrating entering a new country. We were mindful that although fully hidden, the road to the border wasn’t that far away and we’d forgotten to check whether free-camping was legal in Georgia. We kept our voices low and didn’t use our torches, however, just as we were breaking into the chocolate we saw too very bright lights heading towards us. (Tim’s thoughts: oh n#>[%! )…… As they neared it became apparent that these two giants were in full camouflage gear and were in fact from the army. Oh dear, oh dear! 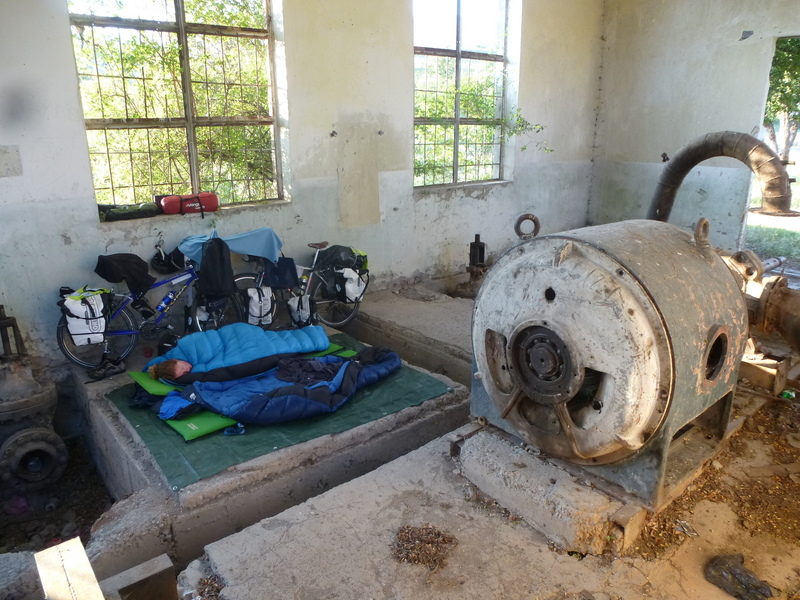 Abandoned hydro-electric station: perfect shelter! After giving us a good looking up and down and Tim proclaiming “English, English” [please don’t shoot], they inspected our passports, checked when we had entered the country then asked if we had a problem. “No problem” we replied, “but our legs are tired, are we OK to sleep here?” They agreed that we would be OK – if we left in the morning – and then gave us their phone number. “Any trouble – you call – we come!” What a result! We now had Army back up! How they found us despite our covert operations we still don’t know – it must be in their training! 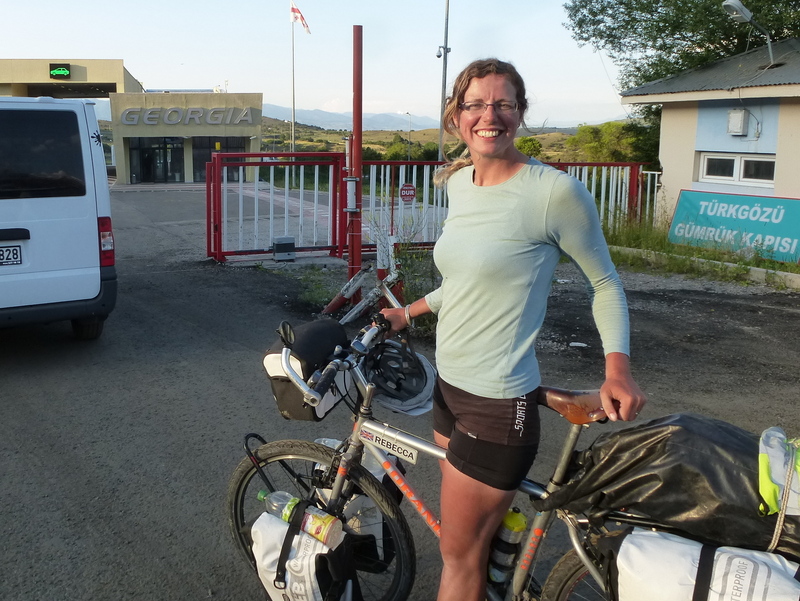 The following day we cycled into Akhaultsikhe and couldn’t resist a beer at a street cafe (it was the only option …. tea just wasn’t available). 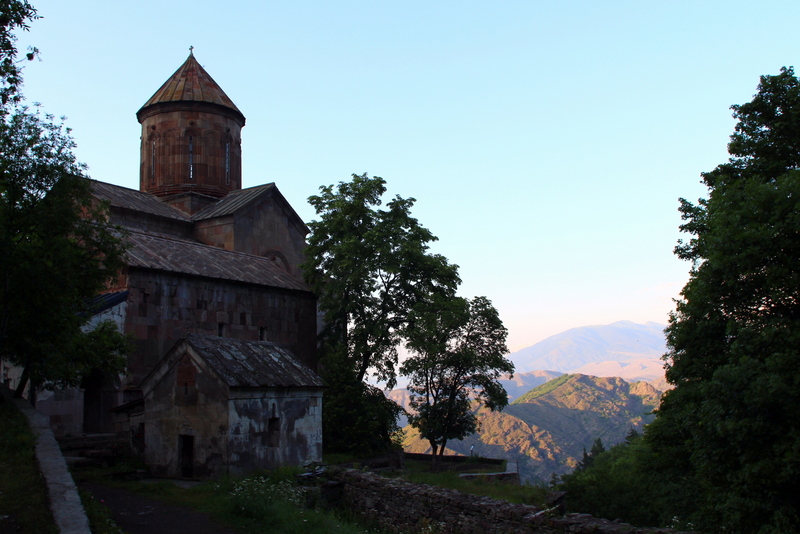 After finding wifi and checking wikitravel, we decided to visit the nearby Sapara Monastery. 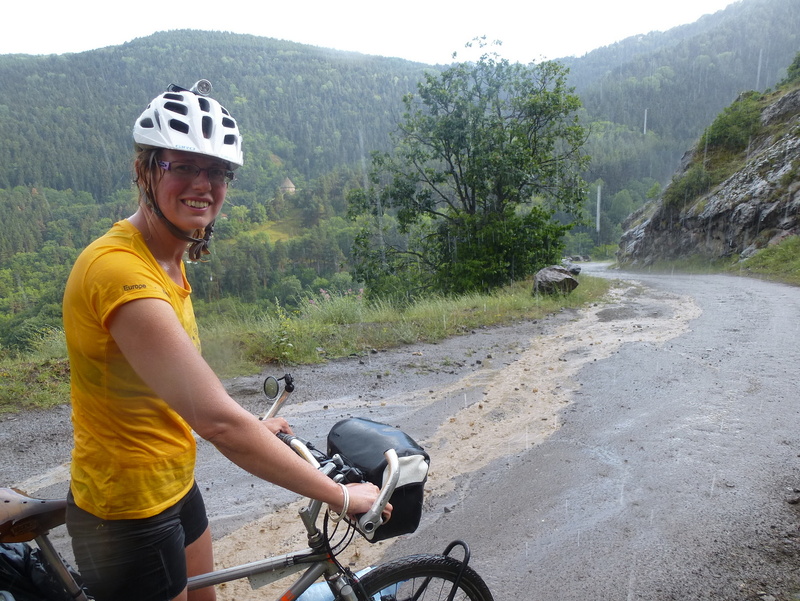 Our research told us that it would be it would be a steep and unpaved 12km climb, but we were ready for a challenge! However, the large lunch, beer and afternoon sun made the going tougher than we’d hoped, and as we passed a church under construction the workers kindly invited us into their cabin. Glad to be out of the sun and to let our stomachs settle we accepted, having forgotten the reputation of Georgian hospitality. 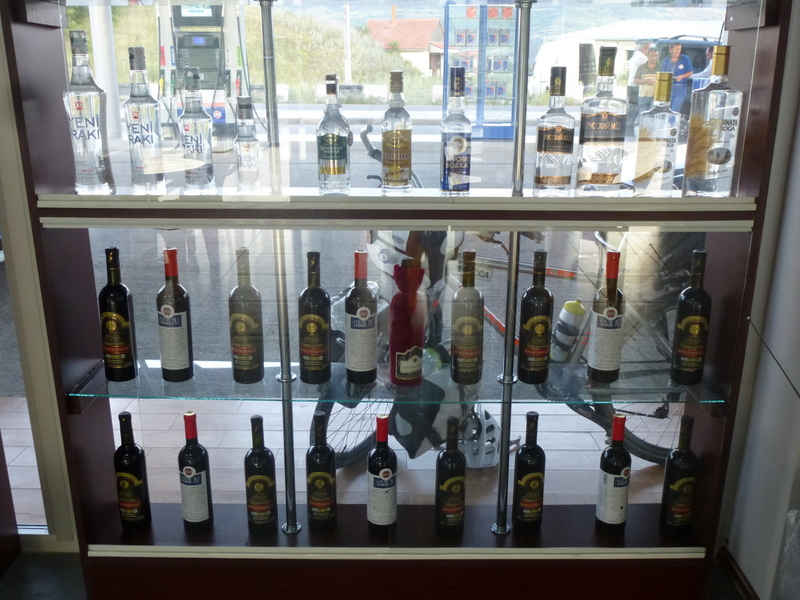 Before we’d got into the cabin, space had already been made at the table and drinks were ready and waiting, and so the toasts began, at first with home-brew wine, then later with vodka, not what we really needed! On top of this they also shared their buffet platter of local specialities, Katchapory (flat bread with cheese inside), meat dumplings, roasted potatoes, salads, breads, etc etc, despite politely refusing at first it was obvious that this would not wash, so we had no option but to eat! It was delicious, they were so friendly but we were stuffed, more bottles of fizz appeared and they continued to recharge the glasses . We quickly learnt that before you could drink, a toast had to be made, so a couple of hours later after many many toasts to English & Georgian friends we said our thank-you’s and continued on up the bumpy track until we were out of sight and in the shade where we stopped and lay for quite a while!! Generous hospitality, empty glasses as we leave! 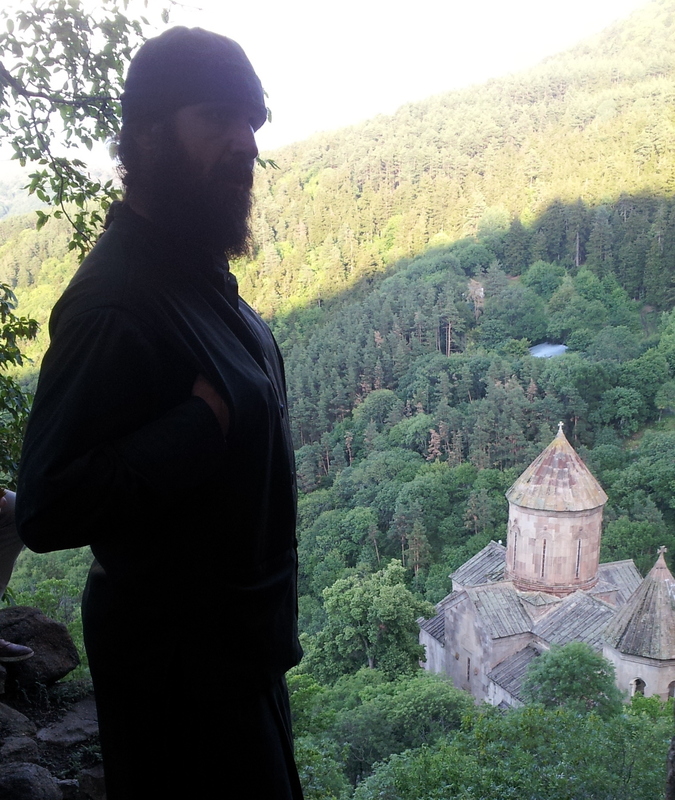 The monastery was well hidden high up in the steep and densely forested mountains. As we got higher, it also seemed to be protected by a thunderstorm; the dry sunny weather gave way to light rain which became heavier, the closer we got the heavier the rain fell and the louder the cracks of thunder became. Worrying that the dirt road would turn to mud and become unrideable, we pressed on as fast as possible hoping that the lightning wouldn’t catch us up. Fortunately, the monastery eventually came into sight, hidden away in its own secret valley. Looking like a pair of downed rats we were welcomed in by a friendly monk and given our very own guided tour of the monastery and surrounding ruined castle. We were even treated to some coral singing by the trainee monks, their harmonising voices echoing around the small Chapel was simple beautiful and incredibly moving. 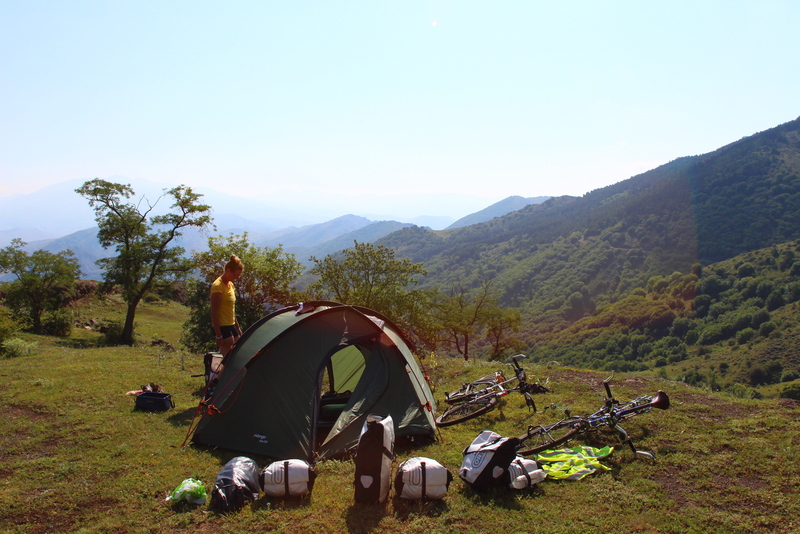 As dusk was falling the rain had stopped and we cycled only a short distance back down the track from the monastery to camp beside a small church over looking the valleys below and the mountains in the distance, one of our most beautiful camping spots yet! Clockwise from top left: A wet and cold arrival at the Monastery, The friendly Monk who gave us the full tour after the coach parties had left, The Monastery and valley, Our Camp with spectacular views.